124 pages | 1 B/W Illus. What is the value of 'faith healing' in understanding distress and treatment in different cultural contexts? What is a critical psychological perspective on faith and religious systems? What challenges do alternative religious practices pose to critical psychology? How should we re-imagine clinical work in a context marked by science and religion? 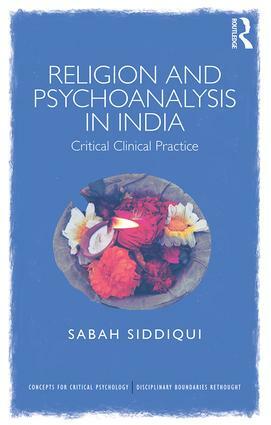 Situated between 'West' and 'East', between the global mental health movement and local faith-based practices in India, the book addresses a wide audience that includes students and researchers in psychology, cultural and medical anthropology, the sociology of religion, cultural theory, postcolonial theory, and the sociology of science. It will also appeal to policy-makers and practitioners interested in the work of NGOs and the legal frameworks driving mental health movements in India. Sabah Siddiqui is a full-time funded doctoral researcher in the School of Environment, Education and Development, University of Manchester, UK. Developments inside psychology that question the history of the discipline and the way it functions in society have led many psychologists to look outside the discipline for new ideas. This series draws on cutting edge critiques from just outside psychology in order to complement and question critical arguments emerging inside. The authors provide new perspectives on subjectivity from disciplinary debates and cultural phenomena adjacent to traditional studies of the individual. The books in the series are useful for advanced level undergraduate and postgraduate students, researchers and lecturers in psychology and other related disciplines such as cultural studies, geography, literary theory, philosophy, psychotherapy, social work and sociology.